HandKrafted by Stephanie: Oh Crop! Hello! I hope you're having a great week so far! Today is my brother-in-law's birthday, and we happen to be visiting him now, so we can help him celebrate in person! Here's the card that I made for him using some Taylored Expressions goodies. 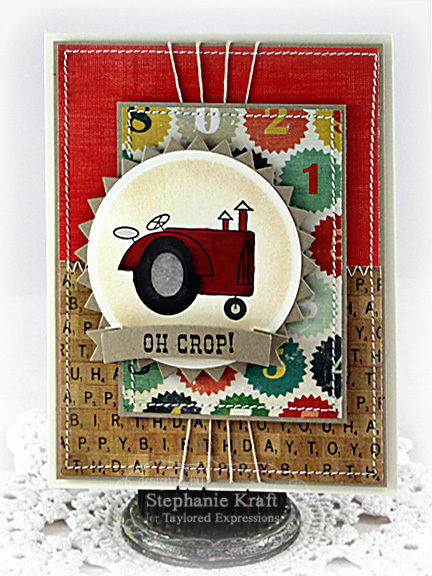 I spent a little time reorganizing my craft room, including my TE stamp when I ran across this one, Green Acres. I bought this as a customer when it was released (intending to use it for my BIL since he is a farmer). I realized that I never had inked it, so I pulled it out to use for his birthday card. 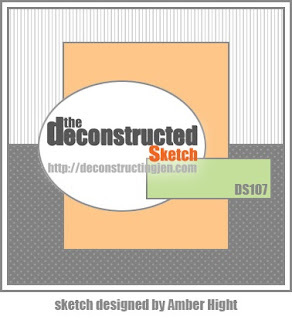 I used Jen's Deconstructed Sketch #107 for my layout. Accessories: Taylored Dies: Branches Banner & Bloom, Pinking Circle Stacklets (TE); Standard Circle Nestabilities - SM (Spellbinders), Markers (Copic), Hemp cord, Foam tape, Thread, Sewing machine. This is SUPER cute Steph! LOVE LOVE LOVE this! LOVE this!! You need to send it to Laurie Schmidlin as she is a tractor driving mama right now as they harvest their hay! What a fun card Stephanie! Perfect sentiment for your BIL the farmer :) Hope you enjoy your vacation!